With over 40 years of experience and expertise, Hirnböck Stabau steel trading handles sheet pile walls, steel beams and steel pipes in varying quality, including used or II a products. We carry out complex welding tasks for reinforcing excavation trenches and deliver our own sealant, “Melavill”, produced by Vilas Austria GmbH. Our wide range of services allows us to reliably meet your needs, even at short notice. Our company offers an extensive range of sheet pile-related services. We will offer you comprehensive advice for all steel-related questions and can make all materials needed available at short notice thanks to our sophisticated warehousing infrastructure. We offer sheet pile for rent and with optional repurchase agreement. We also deliver the materials required upon request. 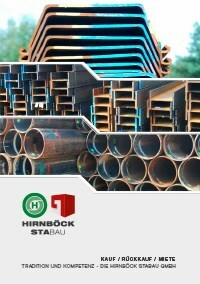 All steel sheet pile products by Hirnböck Stabau can also be purchased used. Our experts take care of the standardised, certified treatment and processing of all products before forwarding them to you. You will always receive the highest quality from your steel experts. Whether sheet pile walls, trench sheets or boards – the steel experts at Hirnböck Stabau are your experienced and able partners for short-notice orders. We are looking forward to receiving your enquiry! Company - Hirnböck Stabau GmbH from Salzburg is specialised in the sale, repurchase and rent of new and used sheet piles, steel beams, steel pipes, trench sheets and steel sheets. With a warehouse stock of approximately 50,000 tons of steel sheets, the company offers its customers a broad variety. If you are interested in our products, please do not hesitate to contact us. You will find our phone numbers and e-mail addresses as well as some of our contact persons under “Contact”.